Abstract: Historically, patients presenting with tooth wear were commonly managed with partial or full coverage cement-retained indirect restorations according to traditional restorative protocols. Conventional rehabilitations are biologically and financially expensive, time consuming and rely heavily on precise laboratory collaboration. 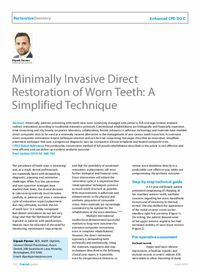 Recent advances in adhesive technology and materials have enabled direct composite resin to be used as a minimally invasive alternative in the management of non-carious tooth tissue loss. As extensive direct composite restorations remain technique sensitive and can be time-consuming, this paper describes an innovative, simplified placement technique that uses a progressive diagnostic wax-up, transparent silicone templates and heated composite resin. Clinical relevance: The predictable, conservative method of full mouth rehabilitation described in this article is cost-effective and time efficient and can deliver an excellent aesthetic outcome. Objective: To describe an innovative, simplified placement technique that uses a progressive diagnostic wax-up, transparent silicone templates and heated composite resin.